29.31 25.57Milton Subdivision is for Jct. Switch with Brampton Subdivision; distance from east end of crossover (M25.48) to order board is approximately 0.15 miles. 4,080 feet West of Station 3,684 feet South of crossover switch. 3,600 feet North of crossover switch. Santa Fe type engines must not operate on wye. Engines must not operate on trestle of W.H. Kentner & Son. South siding—track next south of main track extends from 911 feet east of station to crossover 1092 feet west of station. North siding—track next north of main track extends from most easterly switch to switch located 743 west of station. All switching movements over private crossing west of station must be protected by member of crew and all movements to tracks north of stock pens must preceded by member of crew to give necessary warning. (B.T.C. 27847). Brampton Subdivision main track is used by Milton Subdivision trains. Before proceeding Brampton Subdivision conductors of Milton Subdivision trains must obtain permission from dispatcher at Stratford who will record such permission in train order book as transmitted to and acknowledged by conductor, except when communication with the train dispatcher is interrupted, crossover movement may be made under flag protection. Normal position of switches is for Brampton Subdivision. Trains must obtain terminal clearance at Georgetown. Movements on Brampton Subdivision tracks will be governed by Stratford Division time table and special instructions. Conductors on Milton Subdivision trains, before fouling Brampton Subdivision main track must know that all first class trains due have arrived and left and obtain permission from train dispatcher at Stratford who will record such permission in train order book as transmitted to and acknowledged by conductor. Failure to contact Train Dispatcher movement can only be made under flag protection. Normal position of junction switches is for Brampton Subdivision. 1857 GTR builds station Cooper-2001, p. 266 . 1892 GTR renovates station Cooper-2001, p. 266 . 1904 GTR renovates station Cooper-2001, p. 266 . 1970c CNR removes baggage room Cooper-2001, p. 266 . 1980 CNR removes agent Cooper-2001, p. 266 . HHPC Image No. 10284 Station. HHPC Image No. 315 North (Bramption Subdivision track) and east elevations of station. HHPC Image No. 316 Station. HHPC Image No. 313, Dave Spaulding Collection West elevation of station. HHPC Image No. 314 Station. James Adams photo, Sirman Collection South (Milton Subdivision track) and east elevations of station. HHPC No. 10432 East elevation of station. Gary Mauthe Collection North (Brampton Subdivision track) elevation of station. Robert J. Sandusky photo Station. Robert J. Sandusky photo East elevation of station and water tower. HHPC Image No. 8107, Georgetown Herald Station. HHPC No. 685, Gary Mauthe Collection North (Brampton Subdivision track) elevation of station. 1890c NAC / Col. RG30M Acc. 78903/42 Item 279 G.T.Ry. Alterations and addition to station. Ground floor plan. North, south and east elevations. 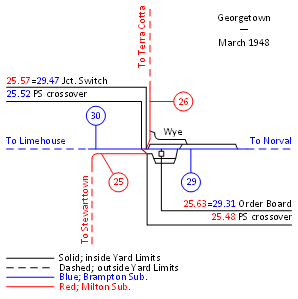 Simplified schematic of Brampton and Milton Subdivision trackage at Georgetown.